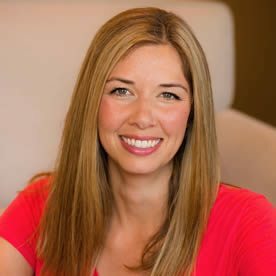 Every year I go to Expo West, a natural products trade show where companies come from across the globe to share their latest natural and organic inventions. 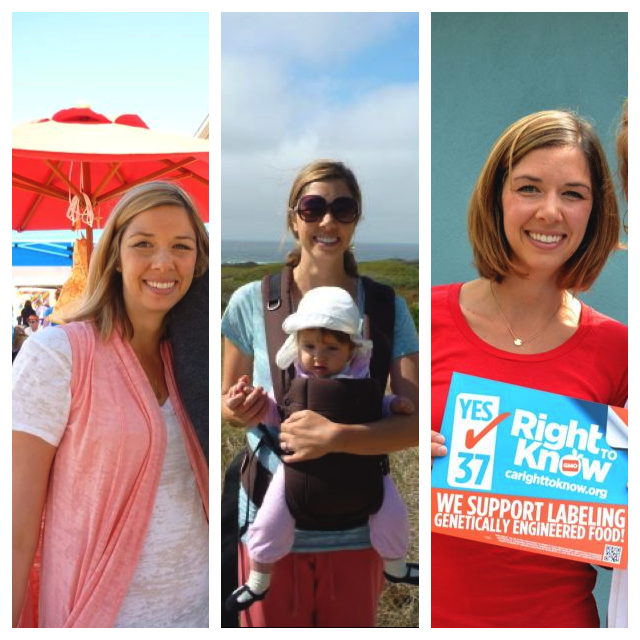 Though this show is technically for healthy products – finding health food there is a rarity. 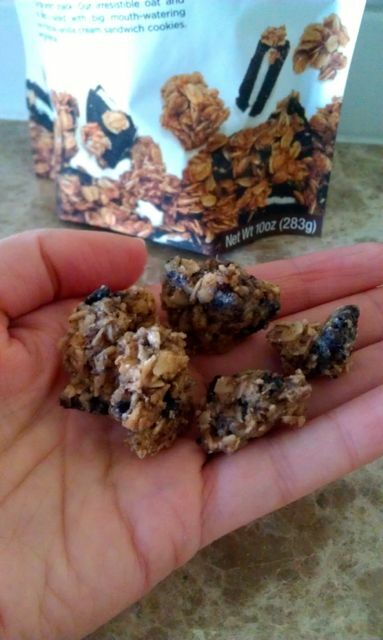 The place is more like a sea of Clif bars and convenience foods that have somehow integrated trendy ingredients like hemp, chia, coconut oil, etc. As usual, we’re better off eating veggies, fruits and other wholesome unprocessed foods. That being said, a few new (or new-to-me) products always catch my eye. Sometimes these are so good I swing by their booths multiple times for additional samples ;). Below were my some of my favorite items at this year’s show. Not all of these are healthy, but they’re all delicious – and certainly better than conventional alternatives. 1. 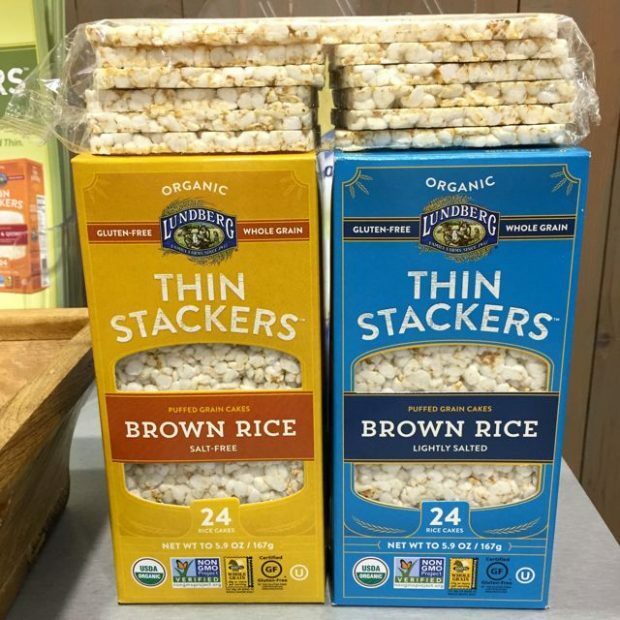 Thin, square rice cakes from Lundberg Farms. Love these because they’re less bulky and less messy than regular rice cakes and leave you more room for toppings! 2. 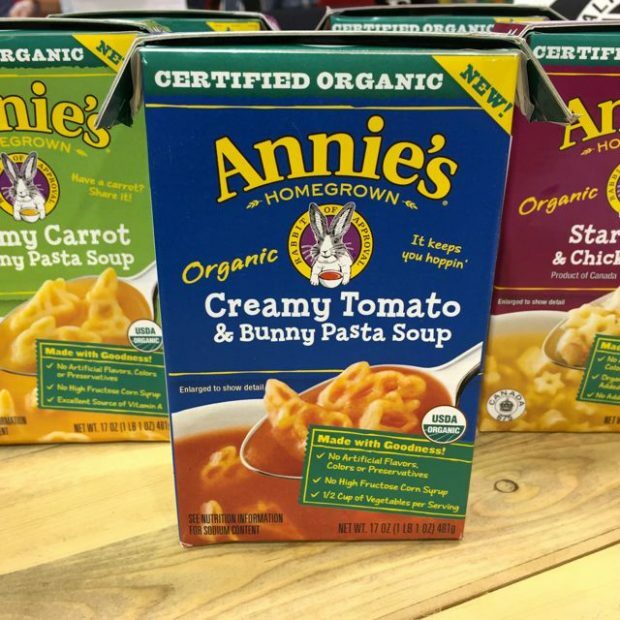 Annie’s boxed soups. 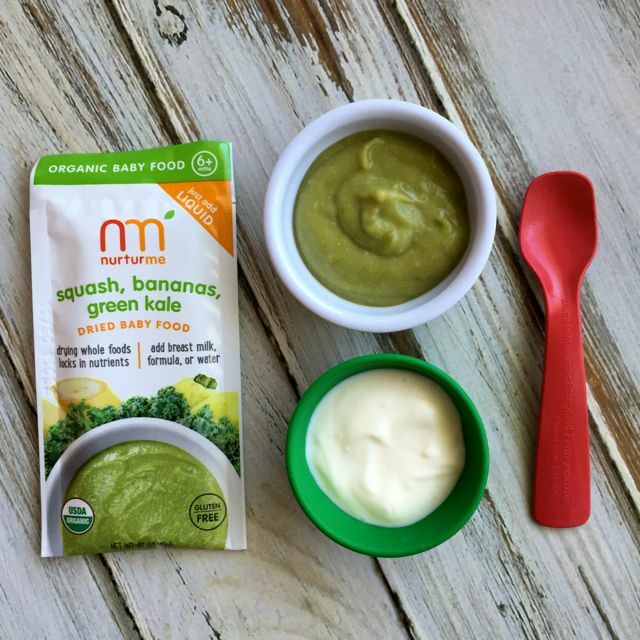 Until now, there was no organic or natural “kid soup” on the market. 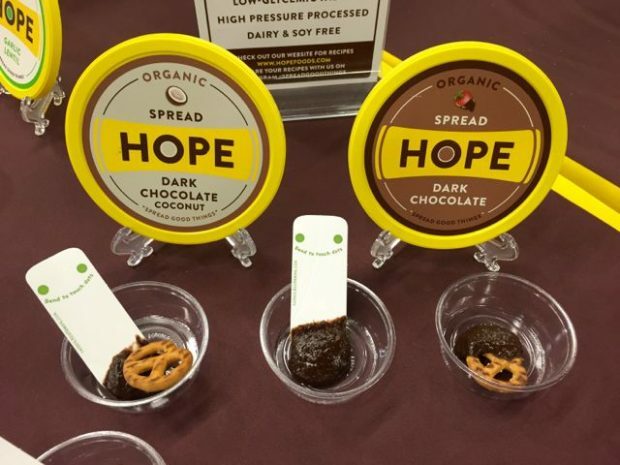 While I don’t really believe in “kid food” being different from “adult food,” I like that there’s now an organic option for parents who otherwise would buy Spaghetti-O’s or conventional processed soups. 3. Organic Prairie Mighty Bar. 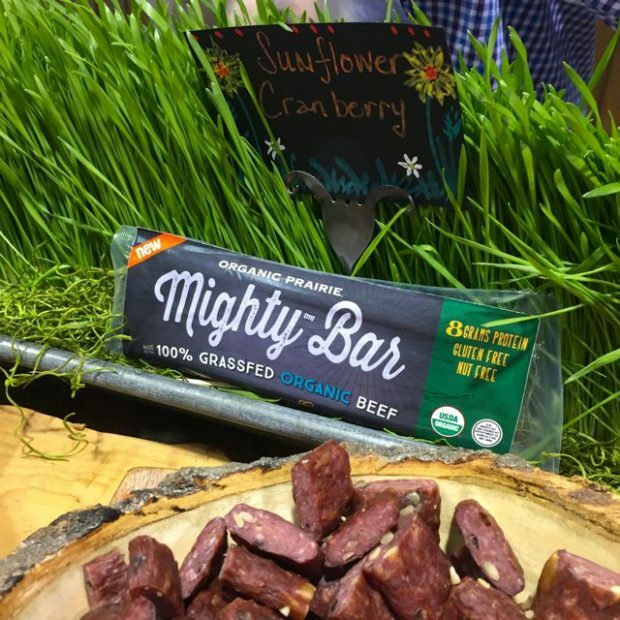 This was one of the strangest products I spotted: a sunflower-cranberry-beef bar (!!) – but it was surprisingly good. It’s grain & nut-free, so a good option for meat-eaters with restrictive diets. Also it’s organic and 100% grassed, since it comes from Organic Prairie (sister company of Organic Valley). 4. Coconut Bliss Bars in Salted Caramel. 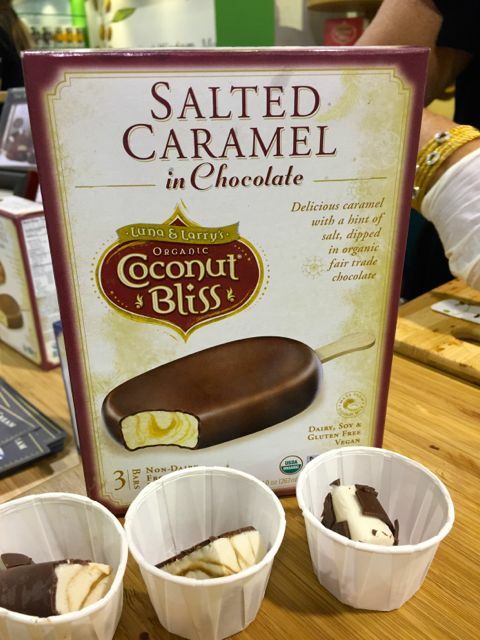 Few frozen desserts top Coconut Bliss in my book, so I was hardly surprised that their new Salted Caramel bar was divine. I could’ve eaten a whole box of these. 5. 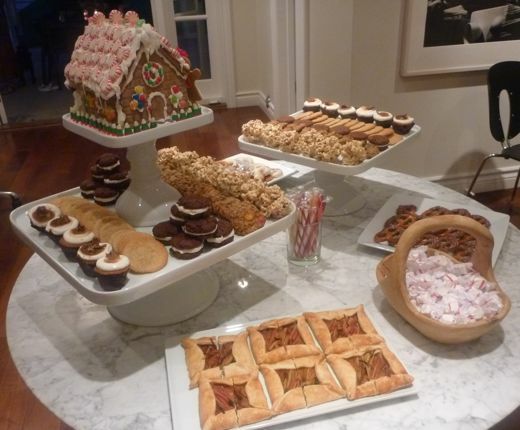 Justin’s Mini Peanut Butter Cups. What could be more perfect? 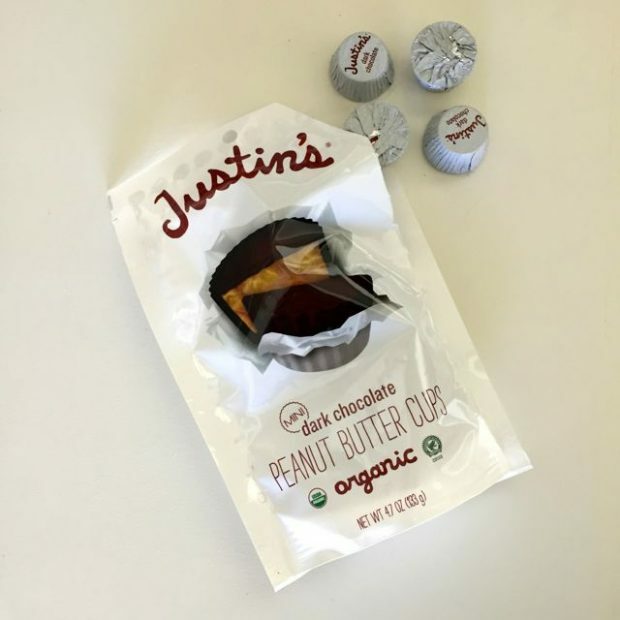 Clearly I’m already a fan of Justin’s PB cups (see these Double Chocolate PB Cup Muffins or these Chocolate PB Cup Cookies for proof), and love that there are now smaller cups for snacking. 6. 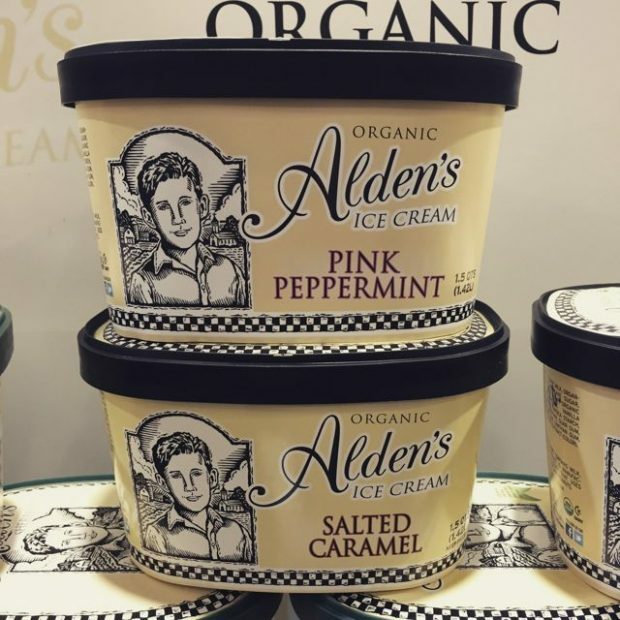 Alden’s Organic Ice Cream in Peppermint and Salted Caramel. Ice cream = my favorite indulgence, and for everyday eating I buy Alden’s. I’ve always loved peppermint ice cream, so I could not be more excited for these new additions to the flavor line-up. 7. Chocolate Coconut Hummus. This isn’t even one of Hope’s new flavors, but it was the first time I tried it and OMG I was instantly hooked. A thick layer of this between 2 slices of fresh whole wheat bread would be the perfect sandwich – and such a healthy one too! Their new Curried Lentil was another favorite of mine. 8. 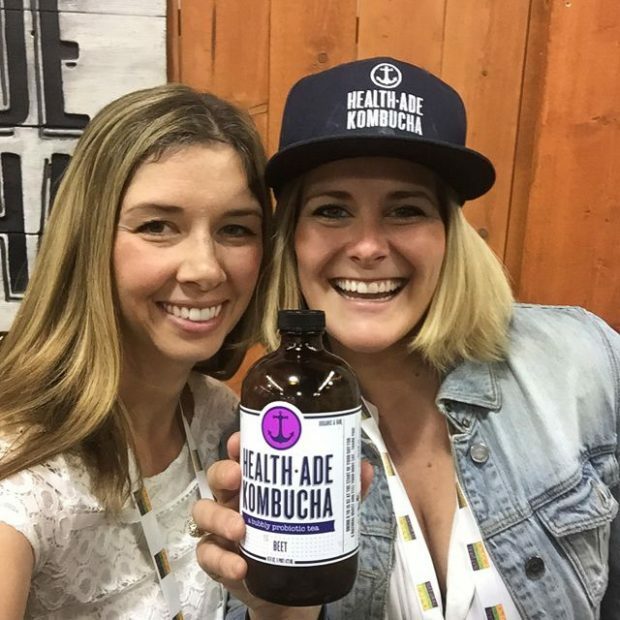 Health-Ade Kombucha. 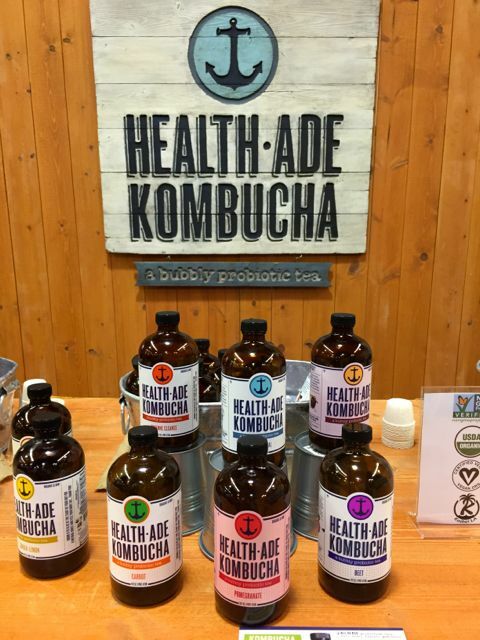 Though not new, Health-Ade (a.k.a Best Kombucha On Earth) is expanding and thus more widely available now. Three of my good friends, including one of my BFF’s Daina (pictured with me above) founded Health-Ade so I am thrilled to see their fan base grow so fast! 9. 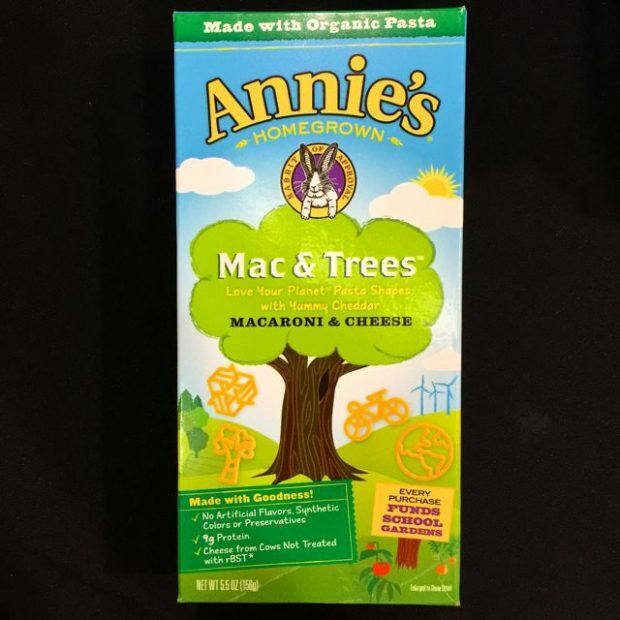 Annie’s Mac and Trees. This pasta – whose noodles are in the shapes of trees, recycling icons, earths and bikes – makes my inner-hippie jump for joy :). If you buy boxed Mac & Cheese, buy this one, and maybe have a conservation lesson with your kiddos while they eat. Let me know if you see or try any of these products! Sugar vs. “Natural” Sweeteners: Which Is Healthier? I love Expo West (and Expo East)!! I used to go all the time at my old job. I would leave every day so full from all the samples! Love Alden’s Organic ice cream .I wish Ralps and Bristol Farms in San Diego carried the new flavors Salted Carmel. And Pink Peppermint.?? I can never find Pink Peppermint either! The Salted Caramel is at my Von’s though – and it’s delicious!